New Polio Vaccine Rolled Out In Massive Synchronized Worldwide Switch : The Two-Way 155 countries and territories are switching to a different polio vaccine, in what health officials say is the next step to completely eradicating the disease worldwide. 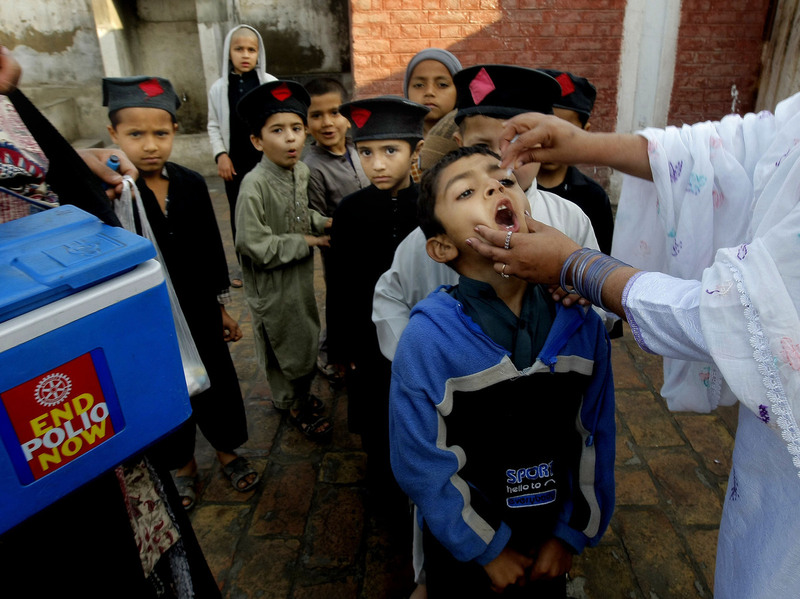 A Pakistani health worker gives a polio vaccine to students in Peshawar, Pakistan, in March. Polio remains endemic in Pakistan after the Taliban banned vaccinations, attacks targeted medical staffers and suspicions lingered about the inoculations. Starting today, 155 countries and territories will start switching to a different polio vaccine. The shift, which is expected to be completed by May 1, is the "largest and fastest globally coordinated rollout of a vaccine into routine immunization programs in history," according to the Global Polio Eradication Initiative. "We're closer than ever to ending polio worldwide, which is why we are able to move forward with the largest and fastest globally synchronized switch ever," Michel Zaffran, Director of Polio Eradication at the World Health Organization, said in a press release. According to The New York Times, it's the "first worldwide vaccine change ever attempted." The progress towards complete eradicating polio shows in the numbers. Last year, 74 cases of wild poliovirus were reported, exclusively in Pakistan and Afghanistan, according to the initiative. In 2016, 10 cases have been reported so far — also in those two countries. By comparison, when the initiative started its work in 1988, "more than 350,000 children were paralyzed every year." As health officials strategize about how to rid the world of the disease, which can cause paralysis, "one important step is to gradually withdraw the oral polio vaccine, starting with the type 2 component," Jackie Fournier-Caruana from the initiative explains. The old oral vaccine (tOPV) protected against three strains of poliovirus, while the new oral vaccine (bOPV) protects against two of the strains. According to the initiative, the transition is possible "because type 2 wild polio has been eradicated." It stresses the importance of closely synchronizing this transition globally: "if some countries continue to use tOPV it could increase the risk of the spread of type 2 poliovirus to those no longer using tOPV." This "massive undertaking" will involve deploying thousands of monitors to make sure tOPV is no longer in use. "Approved disposal methods include incineration, boiling, autoclaving, bleaching or burying in concrete-sealed containers. Each has drawbacks, like the possibility that glass vials will explode. "Adding to the possibility of confusion, the old and new vials and boxes are almost identical. Warehouse managers are supposed to mark the old vaccine with an "X" and bag it for disposal." Dr. Walter Orenstein, who is the associated director of the vaccine center at Emory University School of Medicine, tells the Times, "This is going to be hard. ...For a long time, we've driven people to think of vaccine as valuable. Now we're asking them to destroy it." The initiative says there's a global stockpile of type 2 vaccines, ready to be used in the unlikely case of an outbreak. Type 2 was last detected in the wild in 1999, according to the initiative.